In newly engineered homes with hoods over 400 CFM, there is a new code dictating air replenishment. Although this code has been on the books since 2009, there are inpectors now enforcing it. "Exhaust hood systems capable of exhausting in excess of 400 cubic feet per minute (0.19 m3/s) shall be provided with make-up air at a rate approximately equal to the exhaust air rate. Such make-up air systems shall be equipped with a means of closure and shall be automatically controlled to start and operate simultaneously with the exhaust system." Simply put, air needs to be replenished or “made up” or compensated for the air lost through ventilation. Newer energy efficient, “tight” or “green” homes are well air-sealed so outside air will have more trouble finding a way in to replace exhausted air, as opposed to older draftier homes. So what happens is your house depressurizes. Hood vents can't push out air, because there is no air in your home to replace. It is not a very difficult fix. You simply need air to replace the exhaust. Back when I was specifying ventilation, I would always recommend a damper on the wall cap to prevent cold air from infiltrating into your home. 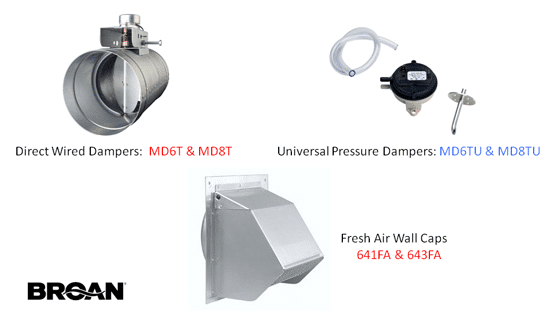 Now with the new codes, the damper is in-line or in the duct itself and is wired to a Universal pressure regulator. The regulator opens and closes the damper depending on how much air is exhausted. The wall cap simply lets in air. If it sounds complicated or expensive, it really is not. Broan manufactures three simple, inexpensive tools to satisfy the code. The cost is less than $300. Have a look below. You still have to duct properly using at least 6 inch duct, and up to 10 inch in pro range installations, with the least amount of turns possible. It is way easier to plan for make-up air before construction then installing afterwards. 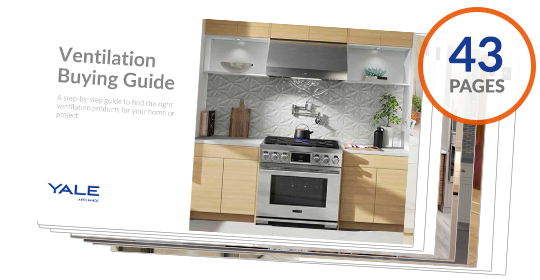 Read more about ventilation by reading the Yale Ventilation Buyers Guide. Over 100,000 people have downloaded a Yale Guide.